The current 2017 Ford Edge may well be the third model year of what's already the second-generation of the big-selling midsize crossover SUV. As well as being a major success here in North America, the Ford Edge is the latest of the company's models to be offered globally after originally only being sold over here. It means theFord crossover SUVis following in the footsteps of the legendary Mustang as Ford dealers in all the automaker's major markets now have it to offer their customers, even in those countries where they insist on driving on the wrong side of the road. The last redesign of the Edge made it noticeably more athletic than its predecessors when it was unveiled for the 2015 model year, and it also boasts performance to match the sporty styling. The Edge retained the unmistakable and highly desirable silhouette of an SUV, but today's Ford model is now moving increasingly towards the more premium end of the segment. However, it's still avoiding falling into the trap of becoming too rugged or too macho and perhaps alienating some female or more urban buyers. The exterior is now unashamedly sporty with a stylish design that puts it right up there with the best Germany, and Japan has to offer, while the actual Sport model takes that theme even further with blacked-out details that emphasise those sporty credentials. A look at the 2017 Ford Edge reveals more good news on the style front, with some of the best quality trims and materials to be found right now anywhere in the midsize crossover segment. The dash even manages to steal some extremely contemporary styling cues from Ford siblings such as the Focus and the Escape, although it retains a slightly more grown-up, mature ambience than those smaller, more affordable models. There's no lack of choice with three engines and four trims to select from with the latest Edge. The SE model is the base trim, and from there the lineup goes to the SEL and Titanium before the fabulous Edge Sport completes the family picture. All models except the Edge Sport come standard with a 2.0-litre EcoBoost engine developing 245 horsepower and 275 lb.-ft. of torque, and every Edge utilises a six-speed automatic transmission to send power to your choice of the front or all four wheels. The SEL and Titanium models also offer the available normally aspirated 3.5-litre Ti-VCT V-6, which then provides the Ford with 280 horsepower and 250 lb.-ft. of torque. The Edge Sport is where you have to be to get to grips with the most powerful engine offered in the lineup, which is another EcoBoost unit, but this one is a 2.7-litre powerplant that puts 315 horsepower and 350 lb.-ft. of torque at your disposal. Recent powerplant upgrades include the introduction of a new twin-scroll turbocharger and a redesigned cylinder head in the 2.0-litre unit, which assists the Edge in delivering fuel economy ratings we'd usually only expect from smaller, less capable and versatile midsize sedans until now. For the record, the 2.0-litre with front-wheel drive is rated as good as 11.3 L/100 km in the city and 7.9 L/100 km on the highway, or 11.5 L/100 km in the city and 7.8 L/100 km on the highway for models that don’t come equipped with auto stop/start. 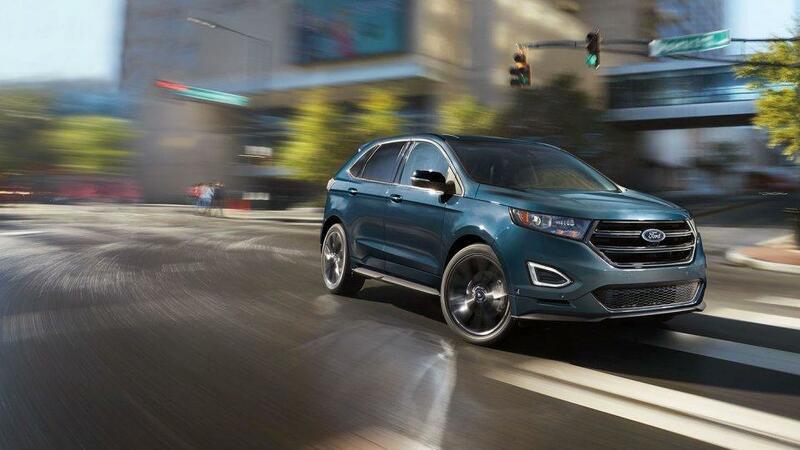 There's an awful lot of choice in the midsize crossover segment right now, so get in touch with us here at Van Isle Ford and we'll show you exactly why you should choose the 2017 Ford Edge.